On January 21-24, partners of SANA 2019: “Civil Society Network for Preserving and Revitalizing Indigenous Languages” held a training seminar and study tour at Inari (Finland) for recipients of SANA mini-grants for community-based language initiatives. 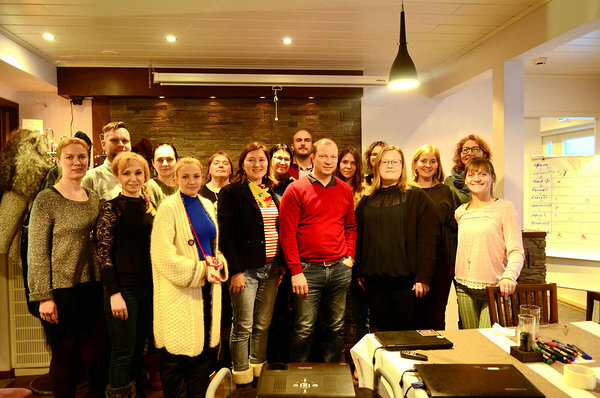 Representatives of 7 language initiatives (from Karelia, Leningrad Oblast, Estonia and Latvia) supported by the SANA 2019 project gathered in Inari to learn about good practices of preserving and revitalizing Sámi languges, to jointly plan the implementation of their initiatives and to become part of the SANA 2019 network. Seminar participants during an introductory training session in Inari. On January 21, seminar participants were greeted by Pentti Pieski, head of Giellabalggis ry – a SANA 2019 partner organisation – and Tiina Sanila-Aikio, President of the Sámi Parliament of Finland, Sámediggi. 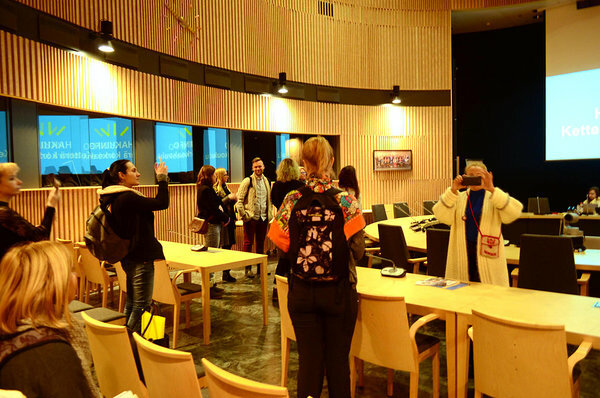 As part of the study tour, SANA 2019 partners and grantees visited SIIDA – a centre housing the National Museum of the Finnish Sámi and the Nature Centre of Metsähallitus and received a thorough overview of these organisations, including their role in promoting Sámi languages, by Áile Aikio and Kirsi Ukkonen. On January 22, seminar participants visited SAJOS, the Sámi cultural and administrative centre in Inari to get a first-hand look at the building that is also the home of Sámediggi. 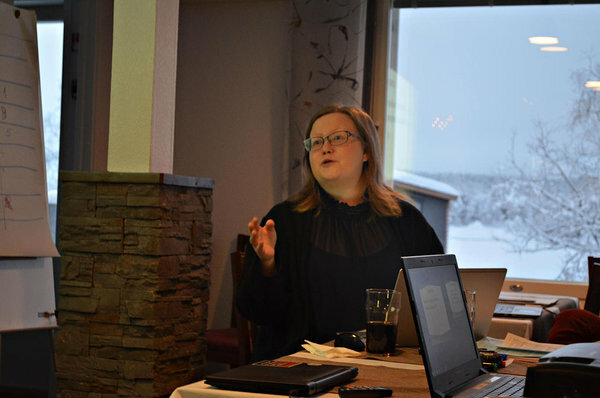 SANA 2019 partners also learned from Tiina Sanila-Aikio about the mission and operating model of Sámediggi (including in upholding Sámi language rights) and the impressive work that has been done in revitalizing Skolt Sámi language – such as the 1-year curriculum for teaching Skolt Sámi to beginners. This curriculum can become a model for several indigenous Baltic-Finnic and other Finno-Ugric languages as well. Tiina Sanila-Aikio presenting an overview of the Sámi Parliament of Finland. More generally, the Sámi experience in preserving and revitalizing indigenous languages ranks among the best in the Finno-Ugric world and has already given inspiration and methodologies to other Finno-Ugric peoples (e.g., the formation and success of the language nest of the House of Karelian Language - a SANA 2019 partner organisation – can be traced back to the example of the Inari Sámi language nest in Inari). 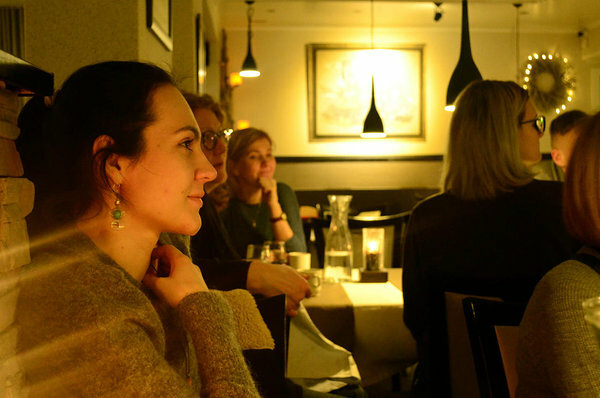 However, the SANA 2019 seminar in Inari demonstrated that there are many more untapped opportunities for language-related exchanges between the Sámi and the wider Finno-Ugric world – some of which may have been triggered already during the seminar. During roundtable discussions, participants discussed future joint projects and opportunities for utilising results of current projects in other contexts. Seminar participants explored possibilities to better align their initiatives with the International Year of Indigenous Languages 2019, as well as exchanged information about the realities of linguistic rights in their respective regions. Internal training sessions of SANA 2019 mini-grant recipients included a workshop to map external audiences and stakeholders for language initiatives supported by the project, and a round of speed-dating between individual grantees that led to new collaboration ideas between representatives of different Finno-Ugric regions. As a result, the seminar helped integrate grantees to the SANA network of community-based language activists and built a foundation for successful implementation of SANA language initiatives.